Enter COAMP in the "referred by" section. 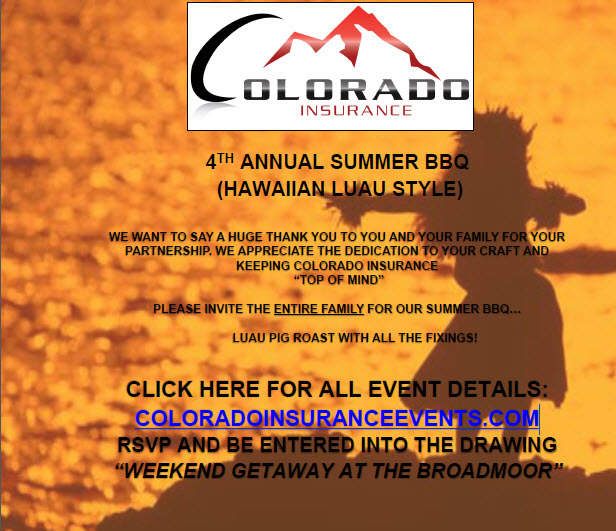 The preferred insurance agency for CoAMP, Colorado Insurance, is hosting their 4th annual summer BBQ at Westland’s Park in the DTC on Sept. 19th. You won’t find another networking event like this one all year long! Not only do they provide a great platform for professionals in our industry to meet and greet, but it's also a nice opportunity to show your family appreciation for everything they endure with your busy work lifestyle. There will be food and drinks, games for adults and kids, many giveaways, and a park full of top professionals to network with. Come enjoy the fun with CoAMP and Colorado Insurance! RSVP: Free for All!www.coloradoinsuranceevents.com Enter COAMP in the "referred by" section.